Two armymen, who sacrificed their lives during anti-terror operations, were among five security force personnel selected for the prestigious Kirti Chakra, the second highest gallantry award. President Ram Nath Kovind on Monday approved a total of 112 gallantry awards for defence and paramilitary personnel for their sacrifices to the nation, the defence ministry said. Havildar Giris Gurung of Gorkha Rifles, Major David Manlun from the Naga Regiment and Pramod Kumar, Commandant of 49 BN, Central Reserve Police Force were chosen for the Kirti Chakra posthumously. Major Preetam Singh Kunnwar of the Garwal Rifle and Chetan Kumar Cheetah, a senior official in the CRPF, have also been selected for the award. 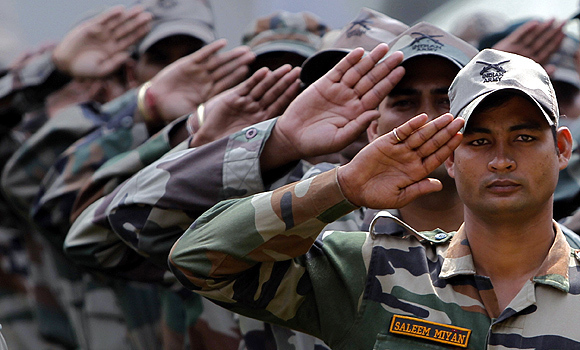 No names for the Ashok Chakra, the highest gallantry award, were announced by the government. The gallantry awards approved by the President, who is also the Supreme Commander of the Armed Forces, include five Kirti Chakra, 17 Shaurya Chakras, 85 Sena Medals (Gallantry), three Nao Sena Medals and two Vayu Sena Medals. On May 20, Havilder Gurung had sacrificed his life during an anti-terror operation in Kupwara district of Jammu and Kashmir. Despite being grievously injured, he charged at a terrorist and fired at him displaying extreme courage and dedication towards call of duty. Major Manlun was killed during an encounter with militants in Mon district of Nagaland on June 6. He was a role model for his colleagues as he always led from the front, the army said in a release. Major Kunnwar has also been conferred the Kirti Chakra for showing grit and determination during an anti-terror operation in Jammu and Kashmir on May 25 during which he had killed three dreaded terrorists. CRPF commandant Cheetah had slipped into deep coma after being hit by bullets during a gun fight with terrorists in Jammu and Kashmir earlier this year. Kovind also approved a President’s Tatrakshak medal, four Tatrakshak gallantry medals and two Tatrakshak meritorious service medals to Indian Coast Guard personnel. Navy personnel who have been selected for Nau Sena medal are Pushpendra Tyagi, Jaskaran Singh and Azhar Azharuddin. The Vayu Sena medals will be conferred on Wing Commander Subhash Singh Rao and Wing Commander Ravinder Ahlawat.